I really didn't think I'd get this done tonight, but it is midnight and I am up. 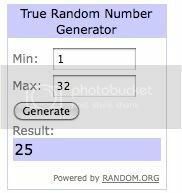 So, I used random.org to pick a winner for the giveaway of Rebecca St. James CD, "I Will Praise You." Laura, I'll be emailing you! Congratulations!! So that is five more chances to win! Best wishes to you all!